315 Commonwealth is located on the north side of Commonwealth, between Hereford and Massachusetts Avenue, with 313 Commonwealth to the east and 317 Commonwealth to the west. 315 Commonwealth was designed by architect George F. Meacham and built in 1878 by Gideon Currier, builder, for Daniel Chamberlin. He is shown as the owner on the original building permit application, dated May 11, 1878. Daniel Chamberlin purchased the land for 315 Commonwealth on September 1, 1877, from Grenville T. W. Braman, Henry D. Hyde, and Henry M. Whitney, trustees of a real estate investment trust that had purchased several parcels of land on March 1, 1872, from the Boston Water Power Company. 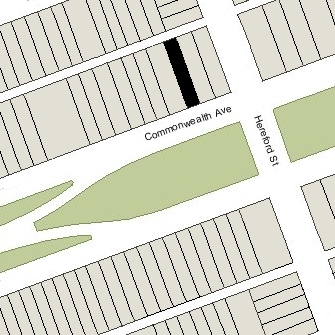 Click here for an index to the deeds for 315 Commonwealth, and click here for further information on the land on the north side of Commonwealth between Hereford and Massachusetts Avenue. Daniel Chamberlin was proprietor of the Adams House hotel at 553 Washington. He and his wife, Abby W. (Chapman) Chamberlin, lived at 1474 Washington. He died in July of 1879 without ever living at 315 Commonwealth. After his death, Abby Chamberlin moved to the Commonwealth Hotel at 1697 Washington. On December 6, 1879, 315 Commonwealth was purchased from Daniel Chamberlin’s estate by Elizabeth (Dana) Dana, the widow of Thomas Dana (her first cousin). Prior to his death January of 1878, they had lived in Cambridge. Thomas Dana had been a wholesale grocer. Among his partners was Thomas Dana, II, Elizabeth Dana’s nephew (the son of William Dana and Lucinda (Weston) Dana), who lived at 311 Commonwealth. Elizabeth Dana lived at 315 Commonwealth during the 1881-1882 winter season, but moved thereafter to Lincoln. She continued to own 315 Commonwealth and lease it to others. The house was not listed in the 1883 Blue Book. During the 1883-1884 winter season, 315 Commonwealth was the home of Samuel Dennis Warren, Jr., and his wife, Mabel (Bayard) Warren. They had married in January of 1883, and 315 Commonwealth probably was their first home together. Samuel Warren was an attorney, in partnership with future Chief Justice Louis D. Brandeis. After his father’s death in 1888, he withdrew from active participation in the firm and assumed management of his father’s paper manufacturing firm, S. D. Warren & Co.
By the 1884-1885 season, the Warrens had moved to 174 Marlborough. 315 Commonwealth was not listed in the 1885-1888 Blue Books. On January 25, 1888, 315 Commonwealth was purchased from Elizabeth Dana by William Tenant Hart. He and his wife, Emma E. (Porter) Hart, made it their home. They previously had lived at 6 East Brookline. William Hart had been in the pork packing business during and after the Civil War. He retired from the firm several years after the war. In the 1870s, he served as president of the New York & New England Railroad, and later served as president of the Continental National Bank. William Hart died in November of 1896 and Emma Hart moved soon thereafter. He died intestate and 315 Commonwealth was inherited by the Harts’ only child, Caroline S. (Hart) Kimball, the wife of Otis Kimball, Jr. They lived at 134 Beacon. 315 Commonwealth was not listed in the 1898 Blue Book. On September 24, 1897, 315 Commonwealth was purchased from Caroline Kimball by Marietta (Shea) Reece, the widow of John Reece (inventor of the buttonhole sewing machine). She previously had lived in Brookline. In 1908, she was living at the Hotel Somerset and 315 Commonwealth was the home of Philip Shelton Sears and his wife Mary Cabot (Higginson) Sears. They previously had lived at Haddon Hall at 282 Berkeley and before that at 184 Marlborough. He was a lawyer and trustee, and later would become a noted sculptor. In July of 1908 they purchased and moved to 205 Commonwealth.. In June of 1908, Marietta Reece married again, to real estate dealer and former Wyoming cattle rancher John Babson Thomas, and they made 315 Commonwealth their home. Prior to their marriage, he had lived in Lexington. During the 1915-1916 winter season, the Thomases were living elsewhere and 315 Commonwealth was the home of James T. Barron and his wife, Elizabeth (Nixon) Barron. Their son-in-law and daughter, Thomas Martin Fitzpatrick and Anna Marie (Barron) Fitzpatrick, lived with them. James Barron was owner of the Thlinket Packing Company in Portland, Oregon, operators of fish canneries. They lived in Portland and frequently summered in Alaska, where he had business interests. From about 1912, they spent the winter seasons in Boston where their son, Robert J. Barron, was in school, and their daughter, Anna Marie Barron, was introduced into society. 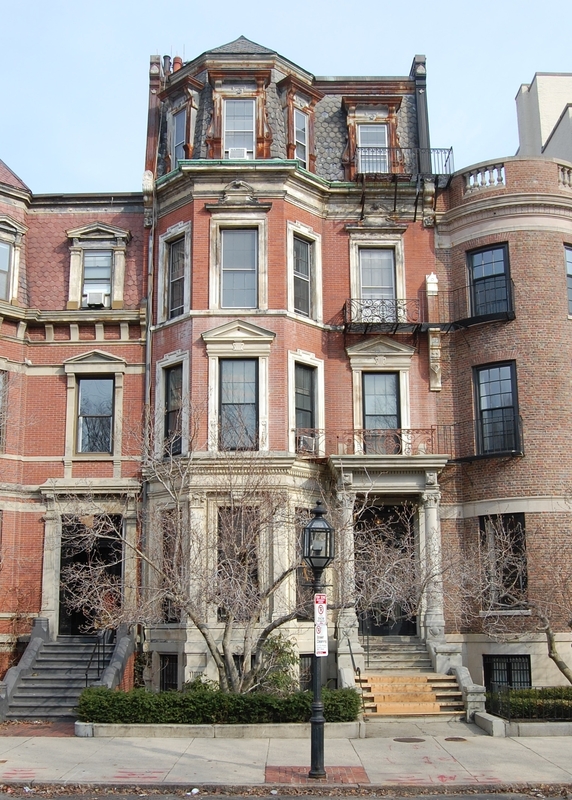 They had lived at 474 Beacon.during the 1913-1914 season, and probably spent the next season in Portland, where Anna Marie Barron married in October of 1914 to Thomas Martin Fitzpatrick, a dry goods merchant from Boston. By the 1916-1917 season, the Barrons and the Fitzpatricks had moved to the Hotel Somerset (in August of 1917, the Barrons’ son, Robert, was killed while serving as a cadet in the Army Aviation Training Corps, drowned while attempting to save two other cadets who had crashed in the Delaware River). John and Marietta Thomas resumed living at 315 Commonwealth during the 1916-1917 winter season. They continued to live there during the 1921-1922 season, but moved thereafter to 34 Gloucester. On August 18, 1922, 315 Commonwealth was purchased from Marietta Thomas by cotton broker and wholesale dry goods merchant Walter Cabot Baylies, He and his wife, Charlotte (Upham) Baylies, lived at 5 Commonwealth. By the 1922-1923 winter season, 315 Commonwealth was the home of the Baylieses’ son and daughter-in-law, Lincoln Baylies and Mary Beatrice (called Beatrice) (Ballard) Baylies. They had married in June of 1920, after which they lived briefly in New York City and then in an apartment at 8 Gloucester. Prior to their marriage, he had lived at 5 Commonwealth with his parents. Lincoln Baylies was a member of his father’s wholesale dry goods firm until his father’s death in May of 1936. He subsequently was employed by the New England Power Association. Walter Baylies died in May of 1936 and Charlotte Baylies died in April of 1939. 315 Commonwealth was inherited by their six children: Lincoln Baylies; Charlotte (Baylies) Clifford, the wife of Dr. Randall Clifford; George Upham Baylies; Walter Ray Baylies; Edmund Baylies; and Ruth (Baylies) Schulze, the wife of Ludwig Frederick Maria Schulze. On March 1, 1940, they transferred the property to the New England Trust Company as trustee of the Baylies Real Estate Trust. On June 21, 1940, Lincoln Baylies acquired 315 Commonwealth from the Baylies Real Estate Trust and, on the same day, transferred the property into his and his wife’s names. Lincoln and Beatrice Baylies continued to live at 315 Commonwealth until about 1941, when they moved to Newton. On July 29, 1941, 315 Commonwealth was acquired from Lincoln and Beatrice Baylies by Miss Stella M. Perry. She previously had lived at 23 Brimmer, where she had operated a lodging house. In September of 1941, she applied for (and subsequently received) permission to convert the property from a single-family dwelling into a lodging house. She continued to live there until about 1944. On March 29, 1944, 315 Commonwealth was acquired from Stella Perry by Elin A. (Villander) Spongberg, the wife of Nels (Nils) Oscar Fredrik Spongberg, who operated it as a lodging house. They previously had lived and operated a lodging house at 111 Commonwealth, and they also operated a lodging house at 197 Commonwealth. Their son, Arne Spongberg, lived with them. They continued to live at 315 Commonwealth in 1946, but had moved to 184 Marlborough by 1947. 315 Commonwealth became the home of their son, Arne, and his wife, Barbara (Anderson) Spongberg, who were married that year. They continued to live there and operate it as a lodging house about 1949. On April 22, 1949, 315 Commonwealth was acquired from Elin Spongberg by her sister-in-law, Lilly Alvida (Spongberg) Hulteen, the wife of Gustaf Ragnar Hulteen, a house painter. They operated it as a lodging house. They previously had lived in Belmont. They continued to live there until about 1955. On December 8, 1955, 315 Commonwealth was acquired from Lilly Hulteen by George Chakurmanian and his wife, Rose (Sarkisian) Chakurmanian, who operated it as a lodging house. They previously had lived in Lawrence. On July 3, 1958, 315 Commonwealth was acquired from the Chakurmanians by Paula Frieda (Goller) Lescrinier Koebbel, the wife of George Koebbel. She continued to operate it as a lodging house. 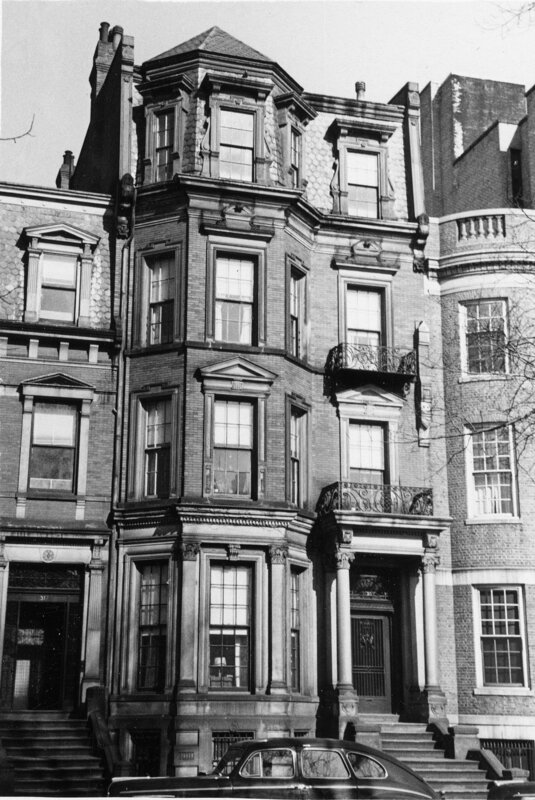 George and Paula Koebbel lived at 114 Huntington, where they operated the Elite Guest House. On September 5, 1961, 315 Commonwealth was acquired from Paula Koebbel by Garland Junior College. The College already owned 329 Commonwealth and 337, 339, 341, 343 Commonwealth. 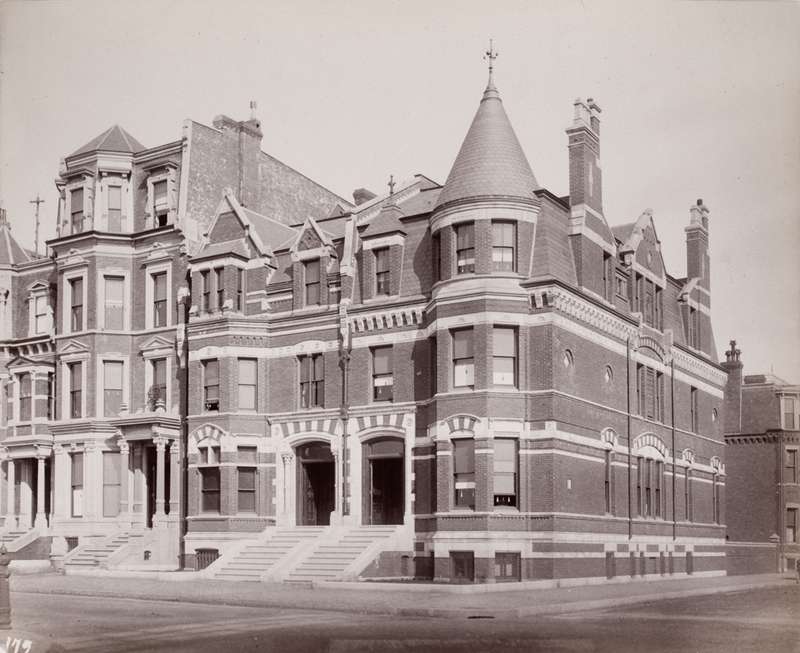 In August of 1961, prior to taking title to 315 Commonwealth, the College applied for (and subsequently received) permission to convert the property from a lodging house into a dormitory. On February 21, 315 Commonwealth was damaged by a fire caused by faulty wiring. On May 27, 1980, Glen Grant transferred 315, 319, 321, 337, 339, 341, 343, and 377 Commonwealth to Judith S. Schwartz, trustee of Seofon Trust (the deed was dated May 27, 1980, but recorded on June 9, 1981). In May of 1981, the Commonwealth College Trust applied for permission to legalize the occupancy of 315 Commonwealth as seven apartments, which it indicated was the existing condition. On June 21, 1981, Judith Schwartz converted the property into seven condominium units, the 315 Commonwealth Condominium. In December of 1981, all seven units were purchased from Judith Schwartz by seven separate trusts established by real estate dealer Eugene William Friedrich: Unit 1, Unit 5, and Unit 7 with Karen A. Goldrich as trustee; Unit 4 and Unit 6 with Pamela D. Lapham as trustee; and Unit 2 and Unit 3 with Kendra Windsor Kaplan (Eugene Friedrich’s wife) as trustee.